Free Bumperstickers - Now you can SAY NO TO GMOS! wherever you go! Thanksgiving Action - Rally and press conference at HEB Corporate Headquarters, November 25, 2002. Consumers want a choice and we want it NOW! The Organic Trade Association in Austin Again - The second annual Organic Trade Association conference took place in Austin May 8 -11, 2002. Last October, a diverse group of shareholders filed a resolution asking Whole Foods Market to label products sold under the Whole Foods private labels with respect to genetically engineered (and non-genetically engineered) ingredients. 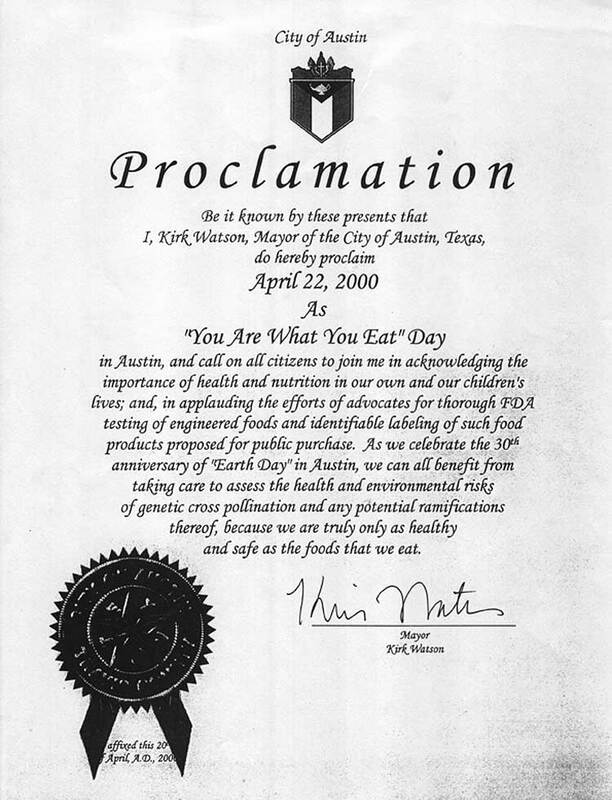 In a dialogue with senior management following the filing, shareholders were told that Whole Foods, Whole Kids and 365 Every Day Value private label products manufactured after October 1, 2001 no longer contained genetically engineered ingredients though they are not labeled as such. The company's reasons for not labeling these products include the current unavailability of a widely accepted, accurate testing protocol for the presence of genetically engineered ingredients and the economic risk of labeling products prior to an FDA ruling on acceptable language for labels. Shareholders urged Whole Foods to consider interim labeling of product packages and advised management that labeling would allow Whole Foods to address not only the consumers desire and right to know about product content but also set an example for the industry. Moreover, labeling would be to Whole Foods' competitive advantage by enhancing the company's reputation. In place of individual product labeling, Whole Foods agreed to shareholders' request to increase consumer access to consistent and clear information throughout their stores and on their website indicating which of their products do and do not contain genetically engineered ingredients. In addition shareholders asked that consumer education efforts regarding genetically engineered foods be strengthened in its GE brochure, in stores and on the website. Whole Foods also informed shareholders about its on-going support for mandatory labeling legislation and for research to establish a reliable testing protocol to determine whether a product contains genetically engineered ingredients. continue a dialogue with shareholders. Shareholders anticipate that Whole Foods will honor its agreement as expeditiously as possible and continue to be responsive to shareholder concerns. A summary of shareholders' dialogue with Whole Foods was applauded at the annual stockholders meeting held March 25, 2002 in Ft. Lauderdale. 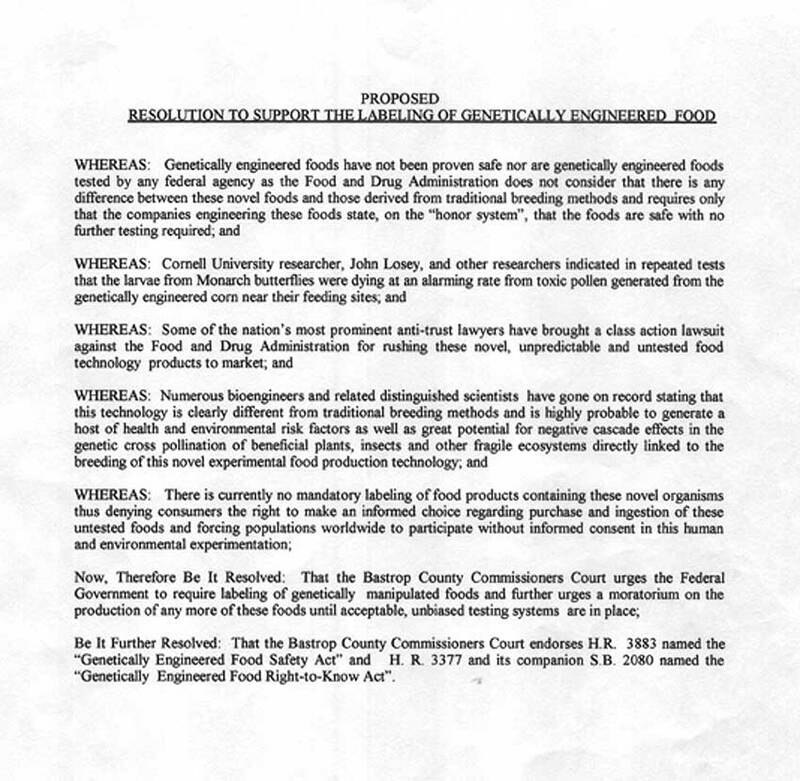 The Bastrop Democratic County Convention held on April 6, 2002 at the Bastrop County Courthouse District Courtroom unanimously passed this resolution on Genetically Engineered Food. It will next be considered by the Democratic State Convention in El Paso from June 13 through June 15. [Resolution on ] Genetically Engineered "Food"
Required labeling of food and other products containing genetically modified organisms or Genetically Engineered products. Halting the sale, trading or distribution of any Genetically Engineered seed used for or intended for use in food and related products. Independent researching of the environmental, safety, and economic consequences of genetically modified organisms and releasing to the public. JIM HOLLAND, retail owner of ECO-WISE, has volunteered to label his products that are genetically engineered (GE) and non-genetically engineered (non-GE). He is the first and only retailer in Austin (and Texas and possibly the US) to voluntarily label GE products. Customers told Jim about the web site www.labelthis.org where consumers can learn how to voluntarily label store products. Jim chose to label his own products, to educate his customers and himself. Most of the products in the store are organic and therefore non-GE. Jim hopes that by labeling products that do contain GE ingredients, consumers will contact the manufacturer about their health and environmental concerns. Grown since 1996, GE plants are not independently tested for human health and environmental risks by US regulatory agencies and no labeling is required. FDA rules do allow for voluntary labeling of GE ingredients. The following is a list of GE crops approved by the FDA. (Source: Union of Concerned Scientists ) Recombinant bovine growth hormone (rBGH) is a GE ingredient that is government approved and unlabeled in milk products. Many foods and non-food products contain these GE ingredients. If you eat foods or buy products that are not organic and contain these ingredients, you may be unknowingly using GE products. Labeling is the only way for consumers to have a choice. Jim is concerned about possible environmental and health risks associated with GE crops. Education is the key to informed decision making. Jim chooses to support organic and non-GE farmers. Other Austin area stores were invited to participate in voluntary labeling of their products but none accepted. Eco-Wise hopes other local retailers, restaurants and grocers will join in this important labeling effort. NOTE: Eco-Wise is not a supermarket although they do sell a few snack bars, drinks and the like. There are other soy/corn/canola/cotton based products in the store that need labels though - for example, clothing, personal care products and milk based paint. Dr. DeGregori presented the case for the genetic engineering of food as being substantially equivalent to the hybridization performed on widely differing plant types in earlier times. Dr. Carman made the point that transgenic (across species) crops were not substantially the same as conventional hybrid crops and that safety testing and product labeling should be done to both protect and inform the public about the food they are purchasing and eating. Dr. DeGregori stated that there were no peer-reviewed scientific studies showing any GE food harm to humans (the accidental mixing of animal-only StarLink corn into corn chips and its subsequent recall, being an aberration). Dr. Carman replied that such studies are impossible without GE food labeling and that we are all part of a massive uncontrolled food experiment right now. Dr. Carman said further that there is evidence of conflict-of-interest in the approval of GE crops as "substantially equivalent" by the US Dept of Agriculture (USDA) during the first Bush administration. The regulator in charge was appointed directly from Monsanto (a major producer of GE seed and herbicides) and returned to work for Monsanto after Bush's term. Dr. DeGregori maintained that environmental groups also had an incentive to raise the specter of Frankenfoods to increase their membership. He also attacked the credibility of scientific articles that have shown damage to laboratory animals which eat GE food. He downplayed the hazards by saying that everything has risk. Dr. Carman's response was why should we take the risk when there are proven safe products already available. He also said the biotechnology companies heavily censor their research papers because of proprietary information and have even suppressed negative results. The freedom of academic investigation and verification is made difficult, if not impossible. According to Dr. Carman, Federal agencies prosecute as whistle-blowers those employees who try to get at the truth. An example was DES (diethylstilbestrol) which the FDA approved in the 1960's. Evidence of problems during trials was suppressed and its use caused genetic defects in the children of users. Only then was DES withdrawn. Dr. DeGregori said he supports government regulation, but a questioner in the audience asked why should we trust the government when it has lied so many times before? Dr. DeGregori said that journals will now refuse to publish articles that have secrecy agreements. To this author, that means that we will see only what the biotech companies will permit. Dr. Carman replied that FDA scientists have dissented during approval and been disciplined as whistle-blowers. He recommended the website, www.bio-integrity.org which documents the consequences of dissenting from approval of GE food. Dr. DeGregori claimed that technological change would be greatly impeded if we waited for absolute safety. Dr. Carman noted the problems of the StarLink corn contamination fiasco where the difficulty of maintaining segregation of the grain supply was highlighted. And while it is true, that there are no epidemiological studies showing harm, such research is impossible without GE food labeling. No one knows what GE foods they may be eating and what problems could be related to eating them. Dr. DeGregori stated that coffee has 1000 chemicals, only 25 of which have been tested. Carcinogens are everywhere, he said, it just depends on the dose whether there is a problem. He made the point that he wants GE food to feed people in poor countries, not profits for agribusiness. Dr. Carman responded that endocrine disrupting chemicals from the 1960's and 70's are only now showing their effects, demonstrating the need for thorough, lengthy studies. As for feeding the poor, the patents, licensing fees and cost of related herbicides like Monsanto's Roundup Ready, make biotech and GE food accessible only to rich nations except where subsidized for market share. Next month the author will present an article about a GE Forum held in Austin featuring farmers who have been sued by Monsanto for alleged license infringements. In one case a farmer has been found guilty of "allowing" GE canola pollen and seed to blow onto and contaminate his conventional canola crop. In another, a large, scattered GE soybean operation has been accused of planting twice the acreage possible based on reportedly faulty sampling by Monsanto's investigators. Can Genetically Engineered Food Harm Children? With all the news about genetic engineering, should I be worried about what my children are eating? Perhaps. Much of the food you buy at the grocery story may have genetically modified ingredients, according to Elaine Marie Lipson, author of "The Organic Foods Sourcebook" (McGraw Hill , $15.95). A Consumers Union study estimated that in 1999, about one-fourth of our farmland is planted with genetically engineered crops. Corn-based and soy-based ingredients are the most common genetically modified foods. "Genetic modification is a process by which genetic material from one species is inserted into the DNA of another species," says Lipson. The technology has been used primarily to make plants emit their own pesticides or withstand herbicide applications. Some modifications slow the ripening of fruits and vegetables or enhance certain traits desirable to growers. "Some bioengineered foods have novel proteins in them that people have never consumed in quantities," says Larry Bohlen, director of the Safer Food-Safer Farms Campaign. Preliminary evidence shows that these proteins may cause allergic reactions. There's also the concern that something that's not proven dangerous still might not be safe, Lipson says. Besides, she adds, genetic modification compromises a healthy relationship with food and decreases our ability to trace how food is handled from start to finish. Not only that, but these plants may generate ecological changes that we can't predict. A troubling phenomenon of "genetic drift" has occurred in which genetically modified plants appear on farms where they were not planted. Although labels don't identify genetically modified ingredients, consumers can avoid them by knowing the manufacturer and where the food was made. Store-brand products at Whole Foods Markets and Wild Oats stores do not contain genetically modified ingredients. You can contact the consumer service departments of other food companies and ask about particular brands. Toll-free numbers and Web site addresses are usually listed on labels and packages. The easiest way to avoid genetically modified foods, though, is to buy products that are certified organic. Existing certification standards, as well as a new federal labeling system that will go into effect next year, prohibit the use of genetic modification in organics. Thanks to increasing popularity (sales of organic foods have grown an average of 20 percent a year for the past decade) and greater availability, organic foods have become easier to find, even at conventional stores. There are organic dairy products, meats, poultry, coffee, chocolate, wine, pasta, snacks and convenience foods. Organic foods are more expensive, in part, says Lipson, because the cost of conventionally grown food is artificially low. Organic systems are more labor-intensive and usually smaller scale, too. If your budget is limited, make organic food for your children the priority. Buying foods in season usually means lower costs. And don't feel that you must buy all organic or nothing. A few priority items can make a big difference. If you have a question about children, send it to the Children's Connection, P.O. Box 26798, Austin 78731. (Aug. 13, 2001 - CropChoice news) As CropChoice reported last week (It's an Indiana effort to protect farmers' interests, Indiana state legislator Bill Friend traveled to San Antonio, Texas yesterday for the National Conference of State Legislatures. He had hoped for passage of resolutions protecting farmers from market rejection of transgenic crops. Friend's resolution read: "Measures should be taken so that new genetically engineered seeds for food and feed purposes are held from the distribution chain until substantially accepted by major foreign buyers as determined by USDA and certified by the secretary of agriculture." The biotechnology and food processing companies were out in force, said Friend, noting that at least eight Monsanto and four Pioneer representatives had come to tell committee members why Friend's resolution would be bad for their business. "No one is speaking up for the little guy," Friend said. "No one is speaking for the farmer. Without those federal subsidies, lots of farmers would be gone. That shouldn't be the path we choose to stay on. The American taxpayer, through congressional subsidy, is paying for R and D on biotech crops. The biotech companies make all the money. The farmer gets to touch it. It goes into his back account, but then they write a check to the biotech-chemical-seed companies" at the beginning of the season. New Study Finds Thousands of Experimental Field Tests of Genetically Engineered Crops Across the U.S.
(Austin, TX) - Nearly 29,000 field tests of genetically engineered organisms were authorized by the Department of Agriculture between 1987 and 2000 despite serious environmental threats and inadequate regulations in place to monitor their impacts, according to a new report released today by U.S. PIRG, the Sierra Club and Genetically Engineered Food Alert. 830 of these tests were conducted in Texas including corn, cotton and rice. When the science of genetic engineering began in the 1970s, the National Institutes of Health (NIH) said experiments that released genetically engineered organisms into the environment were too hazardous and should not be performed. Despite these early calls for caution, a booming agriculture biotechnology industry has developed. The report, Raising Risk: Field Testing of Genetically Engineered Crops in the U.S., documents for the first time the extent of field testing of genetically engineered crops in the U.S. and highlights the potential risks associated with the release of genetically engineered plants into the environment. If field experiments are not properly monitored, genetic pollution can result, inadvertently releasing experimental genes into the environment and putting farmers' livelihoods and the environment at risk. "Our environment is being used as a laboratory for widespread experimentation on genetically engineered organisms with profound risks that, once released, can never be recalled," said Luke Metzger, Texas Field Organizer for U.S. PIRG. "Until proper safeguards are in place, this unchecked experiment should stop." USDA has been far too lax in their oversight of field testing, approving nearly 29,000 field tests through the year 2000. More than 60% of all field tests conducted in the last year now contain secret genes classified as "Confidential Business Information," which means that the public has no access to information about experiments being conducted in their communities. Between 1987-2000, Monsanto (or a now wholly-owned subsidiary) applied to conduct the greatest number of field tests every year, with nearly 2,000 applications. As of January 2001, the ten states and territories that have hosted the greatest number of field test sites are: Hawaii (3,275), Illinois (2,832), Iowa (2,820), Puerto Rico (2,296), California (1,435), Idaho (1,060), Minnesota (1,055), Nebraska (971), Wisconsin (918), and Indiana (886). These experimental genetically engineered crops are growing in the open environment to test the outcome and environmental impact of certain gene combinations. The groups charged that field testing genetically engineered crops in such a widespread way poses serious threats to the environment and neighboring farmers. "Any new technology must be tested, but there are important scientific issues that must be addressed before genetically engineered foods can be released into the environment," said Dr. Neil Carman of the Sierra Club's Lone Star Chapter. To conduct field tests before this has been done is both premature and hazardous; it is like carrying out clinical trials of a drug before the laboratory tests are complete." A goal of the field tests is to obtain information about potential ecological risks associated with genetically engineered organisms. However, independent reviews of the data collected by the Department of Agriculture demonstrate that very little data has been collected. As a result, despite the large number of field experiments that have occurred, fundamental questions about their impact remain unanswered, including long-term impacts on the soil and nontarget species. "Genetically engineered crops have no place on supermarket shelves or in our environment until proper safeguards are in place," added Metzger. "This rush to market has compromised considerations for human health and the environment." Genetically engineered crops are created when a gene is inserted into a host organism. Scientists have raised many unanswered questions about the safety of this radical new technology that relate to both human health and environmental risks. In addition, farmers are losing markets as such trading partners as Europe and Japan shy away from exports of American corn and soybean and instead source grains from other countries. The biotechnology corporations are held accountable for any harm done. Genetically Engineered Food Alert founding members include: Center for Food Safety, Friends of the Earth, Institute for Agriculture and Trade Policy, National Environmental Trust, Organic Consumers Association, Pesticide Action Network North America, and the State Public Interest Research Groups. About 830 field tests of genetically engineered crops were conducted in Texas between 1987 and 2000 despite environmental threats and inadequate regulations to monitor them, according to a report released Thursday by environmental and public interest groups. Texas ranks 11th in the country in experiments, testing corn, rice, sugarcane and cotton. Hawaii ranks first, with 3,275 field experiments. Some 29,000 tests were authorized nationwide by the U.S. Department of Agriculture in the same period. The study focuses on the potential risks associated with the release of genetically engineered plants into the environment. The report, written by U.S. Public Interest Research Group, claims to be the first documentation of the extent of field testing of biotech crops in the country. Genetic engineering is a technology that combines the genes of dissimilar and unrelated species to create new organisms. Biotechnology corporations can use genetic engineering to produce crops with characteristics that would not occur naturally, such as tomatoes with a longer shelf life. Opponents contend that if such field experiments are not properly monitored, experimental genes can be released into the environment and put other crops and consumers at risk. "Our environment is being used as a laboratory for widespread experimentation on genetically engineered organisms with profound risks that, once released, can never be recalled. Until proper safeguards are in place, this unchecked experiment should stop," said Luke Metzger, Texas field organizer for the research group. According to the report, the Agriculture Department has been too lax in its oversight of field testing, approving about 29,000 tests and rejecting only 4 percent of the total number of applications for paperwork errors. Opponents said the public has no real access to information about what kind of experiments are being conducted in their communities because the information is considered confidential. The percentage of field tests being conducted with introduced genes that are considered confidential business information has risen to more than 65 percent in 2000, the report said. The Sierra Club, U.S. Public Interest Research Group and Genetically Engineered Food Alert called for a moratorium on the field testing and commercialization of genetically engineered foods and crops until safeguards are put in place to protect the environment. Biotech crops are grown in the open to test the outcome and environmental impact of gene combinations, but environmentalists contend the widespread field testing of these crops poses serious threats to farmers and the environment. May 18--DANBURY, Texas--Nearly 5 million pounds of genetically modified rice -- the first of its kind -- is to be buried in a landfill next week under orders from the company that had it grown in Brazoria County. Aventis, which took a public relations hit when its bioengineered StarLink corn was mistakenly released to consumers, apparently has decided to destroy its first crop of genetically altered rice rather than risk its being shipped outside the United States, where it has not been approved. The company won't release the rice for famine relief even though the U.S. Food and Drug Administration has approved it, said Jacko Garrett, thefarmer who grew the rice under contract with Aventis. Garrett, who formed the nonprofit Share The Harvest foundation, through which Texas farmers donate rice to the needy, is frustrated that the food won't be given away. Trucks will start hauling the rice to a landfill near Alvin on Monday, he said. "It just bothers me so bad when I'm sitting here trying to find food to feed people and I've got to go bury 5 million pounds of rice when we know it won't hurt a soul," Garrett said Thursday. "That's 40 million people you can feed with that 5 million pounds of rice." Aventis officials have said they don't want to risk the liability that could result if some of the rice should reach markets outside the United States, he said. "If it does, it's going to bring them more negative publicity than they would want to handle," said Garrett, who said he understands the company's legal concerns. Because he grew the rice under contract to Aventis, he said, he is obligated to follow the company's wishes to dump it. Officials at Aventis CropScience in Research Triangle Park, N.C., did not return calls for comment. Aventis, a publicly traded company with headquarters in Strasbourg, France, has been caught in the middle of the debate over biotech food. The company was sued last year after its genetically engineered StarLink corn was discovered in taco shells by a coalition of environmental and consumer groups. 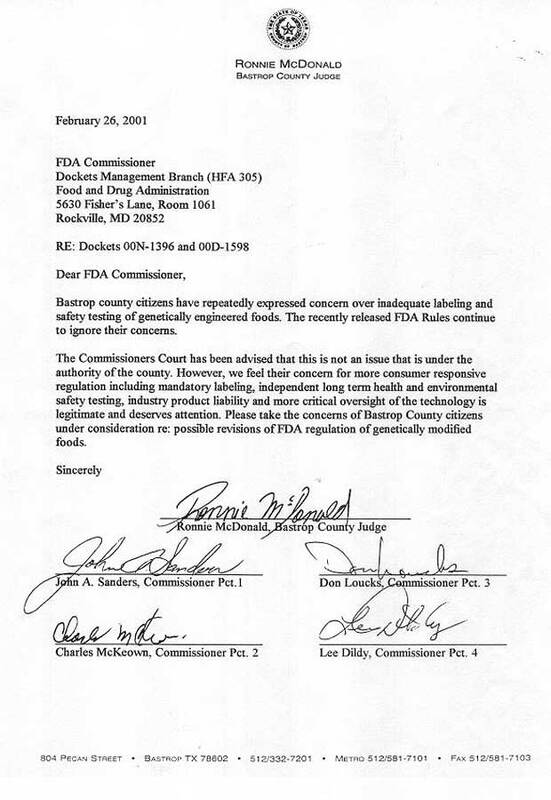 Government regulators had approved StarLink only for animal feed and industrial uses because of unresolved questions about whether it can cause allergic reactions. The corn has not been proven to cause allergic reactions, but Aventis has not been able to track where all of it was sent. Known by the trade name Liberty rice, the grain that was grown in Brazoria County for the company marked the first time that conventional rice had been genetically modified and grown for commercial use. Because it is resistant to one particular herbicide, farmers can eliminate the use of others that usually are needed to control weeds and grasses. At Garrett Farms, between Alvin and Angleton, Liberty rice was the highest-yielding, most-weed-free rice that was planted last year, Garrett said. "I had no expectation that it would do the way it did," he said. Genetically altered corn, soybeans and cotton have been grown in the United States for more than five years and the Grocery Manufacturers of America estimate that 60 to 70 percent of all processed foods may contain biotech soy or corn. While Americans do not have strong opinions about genetically modified food, according to a recent poll, opposition is strong in Europe and Japan. Aventis, formed in 1999 by a merger between French and German companies, announced in November that it intends to divest itself of its agricultural interests and focus on pharmaceuticals. The company had $22.3 billion in sales last year. Unless the company changes its mind, Garrett said, it will take 95 truckloads to take all of the Liberty rice from seven bins at his farm to the landfill. "And here I could be sending it to USA food banks or foreign countries in famine," he said. "They're dying because there's no food and here we are burying food, simply because it's genetically modified. "I have to wonder when people will accept these technologies for the good they bring and allow us to better feed the world and reduce exposure to pesticides and herbicides." DALHART, Tex. — By any measure, Lanny Bezner is a successful family farmer. His eldest son, John, rides herd over his cattle, spread out on pastureland from here to nearby New Mexico. A younger son, Brian, looks after the farm's heavily irrigated cornfields, with help from the husband of Mr. Bezner's daughter, Virginia. As a Texas patriarch, Mr. Bezner rigorously sticks to the principle that economy of scale is the only way to survive in modern farming. The bigger the farm, the better likelihood of turning a profit, he says. By buying adjacent fields, he has expanded his cropland from its original 700 acres to more than 8,000. In five years he has doubled his grazing land by leasing 90,000 acres of pasture. He owns a fleet of tractors and heavy farm equipment; he fills their tanks with fuel from his own gas pumps. He dries and stores his harvest in his own imposing grain elevators, which hold more than a million bushels of corn. Surveying the farm that he carved out in the Panhandle landscape of dry mesquite and sagebrush, Mr. Bezner says the key to his family's prosperity is federal farm subsidies. "We're successful primarily because of government help," said Mr. Bezner, 59, an entomologist who grew up on a farm outside Amarillo. Although Mr. Bezner hesitated to discuss the size of those subsidies (and refused to divulge how much he makes without federal help, or what his expenses are), government documents show that in the last four years of the 1990's, he received $1.38 million in direct federal payments. Most remarkably, Mr. Bezner and the other big farmers here in Hartley County and across the country received those record-breaking payments in an era when farm subsidies were slated for extinction. Under the Freedom to Farm Act of 1996, swept up in the language of the Republican revolution under Speaker Newt Gingrich, farmers who planted row crops — corn, wheat, soybeans, rice or cotton — were freed from government production controls. In exchange for being able to plant what they wanted, they were told, they would have their subsidies gradually phased out. While farmers embraced their new freedom to decide what to plant, they balked at accepting the rigors of the free market. When prices for their crops held stagnant and their costs rose, farmers lobbied Congress for "emergency" payments. Their friends in Congress relented. Instead of diminishing, the subsidies have nearly tripled with steep emergency payments that reached $22 billion last year, according to Keith Collins, the top economist at the Agriculture Department. Supporters of farm subsidies, which were enacted in the Depression, argue that they are needed to save the family farm. But government documents indicate that the prime beneficiaries hardly fit the image of small, hardscrabble farmers. Because eligibility is based on acreage planted with subsidized crops in the past, the farmers who have the biggest spreads benefit the most, according to the Environmental Working Group, a nonprofit advocacy organization that obtained government records of farm subsidies through the Freedom of Information Act. "The data shows that government subsidies are tilting the playing field in favor of the largest farms," said Clark Williams-Derry, the senior analyst at the Environmental Working Group who created a national database of subsidies. Mr. Bezner, who saw his direct federal payments balloon from $164,621 in 1996 to $741,839 in 1999, is one of the elite 10 percent of American farmers who receive 61 percent of the billions of dollars the program distributes. The subsidies have been a chief source of capital for large operators to expand their holdings, often by buying out their smaller neighbors. And unlike other federal entitlement programs, farm subsidies have no requirements of income, assets or debts. As Congress considers reauthorizing the Freedom to Farm Act, lawmakers have already made one fundamental decision: they will keep the subsidies. The phaseouts are a thing of the past. The cost, and the fact that the money goes mostly to a select few, will be at the crux of the debate over how to reshape subsidies. "The cost of this program is astonishing," Mr. Collins said. "Any person engaged in small business in America would be amazed looking at this. Their jaws would drop at the money farmers receive." Mr. Bezner makes no apologies for accepting the money. To his mind, government subsidies help the American consumer by making sure grocery stores are stocked with inexpensive food. "That government money is keeping cheap cereal on the shelves in New York City," he said. And no one expects farmers to lose their subsidies — not with the friends they have in Congress. The top leaders of both parties represent farm states that rely on subsidies. In the Senate, the majority leader is from Mississippi and the minority leader from South Dakota. In the House, the speaker is from Illinois and the minority leader from Missouri. The relevant committees are headed by representatives from farm states; the chairman of the House Agriculture Committee is Representative Larry Combest, a Republican who represents Mr. Bezner's district in the northern plains of Texas. "Look at the Nasdaq: those companies are going out of business and we don't open up the Treasury to them," Mr. Collins said. "But Congress chose not to let farmers bear that kind of pain." Like their counterparts in Hartley County, large farmers around the country have complained to Congress that Freedom to Farm is not working because their crops are selling at the same low prices their grandfathers' crops fetched 40 years ago. When lawmakers passed the act in 1996, they approved generous subsidies for the first two years in order to give farmers a cushion to prepare for their independence. But when the world market pushed prices down, farmers asked for emergency payments. In 1998, Congress approved additional money, adding 50 percent to the core subsidy payments. In 1999 and 2000, the lawmakers doubled the core payments. This month, with the strong backing of the White House, Congress added $5.5 billion to next year's budget blueprint to cover potential emergencies. The concentration of payments will remain the same: the wheat-growing plains states from the Texas Panhandle through North Dakota; the Corn Belt across the Midwest; and the rice and cotton states of the Mississippi Valley from Missouri through Louisiana. While there are other subsidy programs, like those for dairy farmers and sugar producers, the row-crop payments are by far the biggest. Ranchers, and farmers who produce fruits and vegetables, receive virtually nothing from this program. Representative Combest said he had concluded that the subsidy system should remain intact. His one minor proposal is to cut subsidies when farmers receive higher prices for their crops — what he calls a "countercyclical" approach. Even though President Bush has promised to eliminate what he calls corporate welfare, Mr. Combest and some Republican leaders see no contradiction between the farm payments and Republican free-market orthodoxy. They contend that the subsidy is meant to help the consumer, not the farmer. "The consuming public has been the beneficiary of this program that gives money to farmers to produce low-price commodities," Mr. Combest said in an interview. "We don't want to become as dependent on foreign food as foreign oil." Those emotional appeals fall flat with his counterpart, Senator Richard G. Lugar, the Republican from Indiana who is chairman of the Senate Agriculture Committee. "Let's not make a mistake that these subsidies are pro-consumer; they are pro-producer," Senator Lugar said in an interview. "There would be extraordinarily adequate supplies of food in America if you had no control and no subsidies." Senator Lugar said he wanted a revised farm policy to provide more money to conserve land, improve rural communities and help farmers who are not doing well. He also said he was under no illusion about the effect of the multibillion-dollar payments. "The rhetoric of failing farms doesn't always match the reality, because large commercial farmers are doing well with their subsidies; their land values have gone up and so have land rents," Mr. Lugar said. Eight percent of the country's farms produce 72 percent of the country's harvest. Most of the rest of the two million American farmers earn their incomes from jobs off the land. Instead, Senator Lugar said, these crop subsidies are a direct transfer of taxpayers' money to rural landowners. "Is the American public willing to spend money each year and every year providing a transfer payment from the taxpayers to the agricultural sector?" he asked. "And how much — 5 billion, 10 billion, 15 billion?" What no lawmaker is expected to do is ask farmers to prove they need the subsidies. "This is not meant to be a welfare program, and it won't be — not if I have anything to do with it," Representative Combest said. Agriculture economists say such an argument misses the point. "In our food stamp program we means-test the working poor with strict requirements, but we ask nothing of farmers," said Mr. Collins, the Agriculture Department economist, who called the subsidies "an income supplement from the government." Even in Mr. Combest's Congressional district, where federal subsidies make up more than one-third of the total farm income, Hartley County holds a special place. The top 10 percent of the county's subsidy recipients were paid an average $396,131 from 1996 to 1999 — more than double the national average. And in the pecking order, Lanny Bezner ranks third. Two other Hartley County farmers received more money: John Cover, whose subsidies totaled $2.3 million over that period, and Carl Kupyer, who received $1.9 million. With subsidies of that size, those families rank among the top 10 recipients in Texas and the top 100 in the country. Yet the Kupyer family considers the subsidies barely large enough to keep it in business, according to J. C. Kupyer, who works with his father, Carl. "We do make a living as farmers," J. C. Kupyer said. "But actually it would be hard to farm without subsidies." For three generations the Kupyers have been adding to their property, building their farm from less than 700 acres to a 16,000-acre spread that they now own free and clear. Yet with spiraling energy costs, Mr. Kupyer said, the family would sell the farm if someone offered to buy it. Mr. Cover refused to discuss his subsidies. Andy Michael, the Hartley County commissioner and a rancher, said he discounted many complaints from big farmers like Mr. Kupyer. In his view, farmers complain to cover up how much money they are receiving from the government. "The farmers are very closemouthed about getting help from the government — they never, never talk about it," Mr. Michael said. "Farmers work the system. There's no system for us to work." In the last five years, he said, the classic divide between farmers and ranchers, exploited in generations of cowboy movies, has gotten worse, because farmers are receiving bigger subsidy checks while ranchers get nothing. "Any time I'm around farmers they say farming doesn't pay, but then they go out and buy those $150,000 tractors with their government checks," Mr. Michael said. "When times are tough for us, the rancher just tightens his belt." Business is good for Mr. Michael and many other farmers and ranchers in Dalhart, a town of more than 7,000 people midway between Dallas and Denver. Local farm equipment dealers report that despite the downturn in crop prices, their sales of tractors and other equipment are among the best in the country. At the John Deere dealership, farmers have spent $13 million to $21 million on agricultural equipment every year since Freedom to Farm was enacted. "This is one of Deere's strongest markets," said Mark Miller, finance manager at the Dalhart dealership. Ralph Link is a Hartley County farmer who cannot afford new tractors. He works his 845-acre spread himself with used equipment and received $173,787 in subsidies the first four years of Freedom to Farm. But unlike his neighbors with larger farms, Mr. Link has nothing but praise for the prosperity that comes with federal checks. With his new freedom, Mr. Link has been able to take advantage of the region's shift toward agribusiness and plant all his cropland in corn, selling it to one of the huge cattle feedlots. In bad times, he says, the checks provide a safety net. In good times, like the current season, the subsidies will provide him with a good profit — this season, he says, it will be 18 percent. "The government payments are bigger since Freedom to Farm, so I don't understand why you wouldn't like it," Mr. Link said. "Things couldn't be better."